There is no genre in modern cinema that is currently more dominant than the comic book genre. At the worldwide box office last year, four comic book titles occupied the top 10 - more than any other genre and there are few properties that carry such a cast iron guarantee of box office returns as those situated inside a comic book shared cinematic universe. However, as with any field in entertainment that yields such consistently high earnings, competition is fierce with Disney’s Marvel Cinematic Universe (MCU) leading the way as their cumulative worldwide grosses reached $11 billion last year. This has led to Warner Brothers, 20th Century Fox, and Sony Pictures chasing behind with varying degrees of comparative success with their own comic book properties. Particular attention has been paid Warner Brothers’ DC Extended Universe (which contains such iconic characters as Batman, Superman, and Wonder Woman) as the main potential rival to the MCU. 2016 was a watershed year for the studio as their two releases -Batman vs. Superman: Dawn of Justice and Suicide Squad - disappointed critics and audiences alike and only merited moderate box office success in comparison to the market leaders. Likewise, they faced further competition from 20th Century Fox as they unleashed a new breed of hero upon eager audiences. It’s still unclear exactly who leaked the first footage of Ryan Reynolds voicing a CGI version of Marvel’s wise-cracking anti-hero, Deadpool, in 2014. The reason was perhaps more apparent as the footage garnered much approval amongst fans and convinced 20th Century Fox - who own the rights to Marvel’s X-Men IP, which Deadpool is a part of- to tentatively greenlight the project with a modest production budget of just $60 million. Such a comparatively small budget was likely allocated to the project due to the final film expected to receive an R-rating, which at the time was seen as a certificate that would marginalise product in the comic book genre by being unsuitable for family audiences. 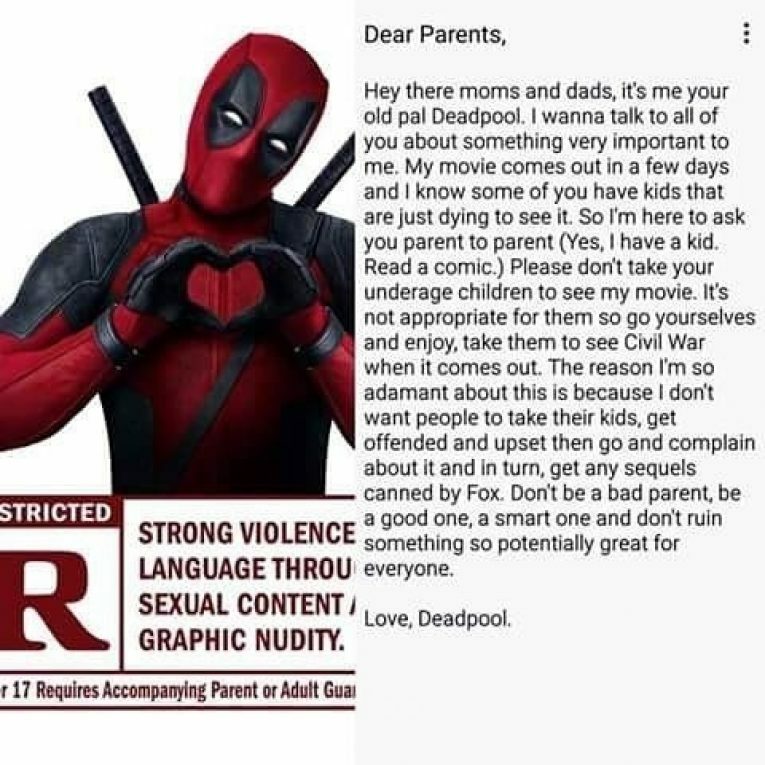 Indeed, just before the film opened, Fox released a Deadpool “PSA” explaining why his upcoming feature film would not be suitable for younger audiences. As the film's promotional campaign began to roll out, audience response was largely positive with the first two trailers for the film receiving decidedly positive reactions amongst commenters. This positive sentiment carried through to the release of the film which earned the highest opening weekend gross for an R-rated film in the US of $132 million. Deadpool went on to gross $783 million during its cinema release in February 2016 and gained an ROI of 1200% (based on earnings over production costs), which was the highest in last year's top 10 grossing movies. What was seen as initially a gamble and a passion project to appease fans by Fox had turned into the biggest success story of 2016 in cinema and a sequel was greenlit almost instantly. It also paved the way for Fox's next R-rated X-Men spin-off Logan which has enjoyed similar success in 2017. 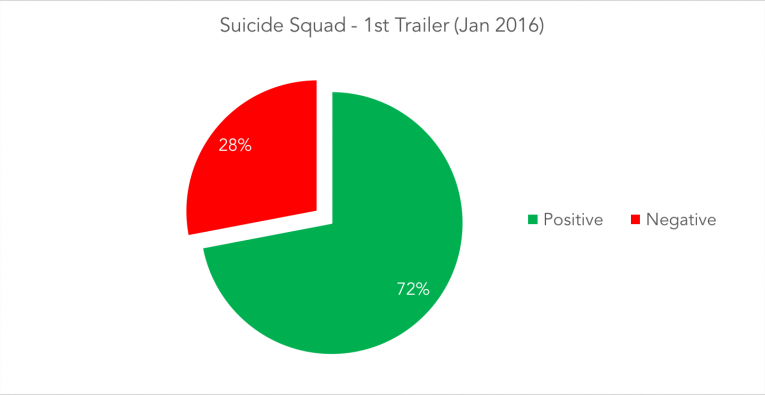 After the surprise success of Deadpool, eyes in the comic book audience turned to Warner Brothers’ similarly anti-hero infused Suicide Squad which was experiencing a massive amount of engagement for its first trailer a month before the release of Deadpool. 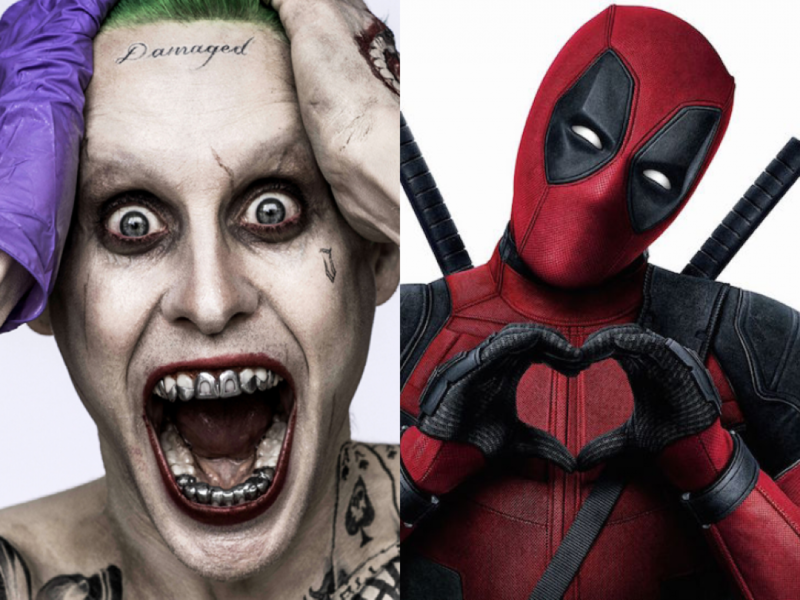 If Deadpool was the underdog of last year’s comic book movies, then Suicide Squad was considered its champion-elect as the film's stylish and highly expensive marketing campaign began (rumoured to be in excess $100 million). The film’s first trailer received over 80 million views on WB’s Youtube channel, making it the most viewed live-action trailer distributed by a studio on Youtube in 2016 and dwarfed the initial attention received by Deadpool’s debut trailer as illustrated below. The sentiment which Suicide Squad was receiving in its pre-release phase, though, was not so favourable. While Suicide Squad was seeing an estimated 46% more mentions for its trailers in comparison to Deadpool, it was also receiving nearly double the negativity in sentiment as well. 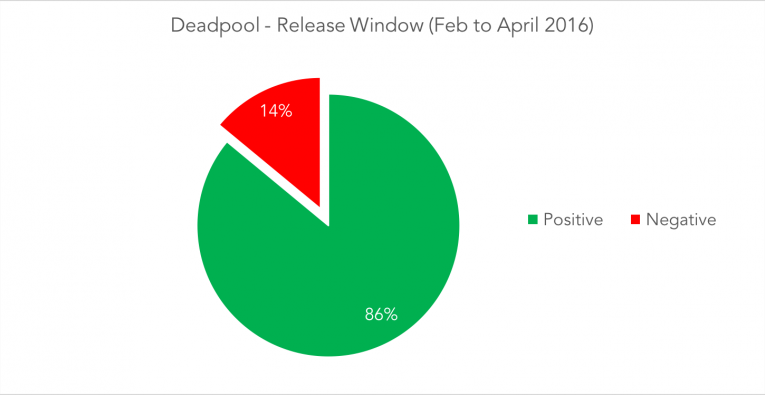 And, like Deadpool, it was a sentiment that remained consistent when it came to the release. While Suicide Squad opened strongly in August 2016 with a $133 million weekend take (a new record for the month) it didn’t sustain such prosperity as it dropped off 67% in its second weekend (10% more than Deadpool). The film also met with a very harsh critical reception earning a very rotten 25% on rottentomatoes.com which wouldn’t have helped its chances, but its Audience Score of 64% was more lenient and in line with the sentiment we gathered for its release window. 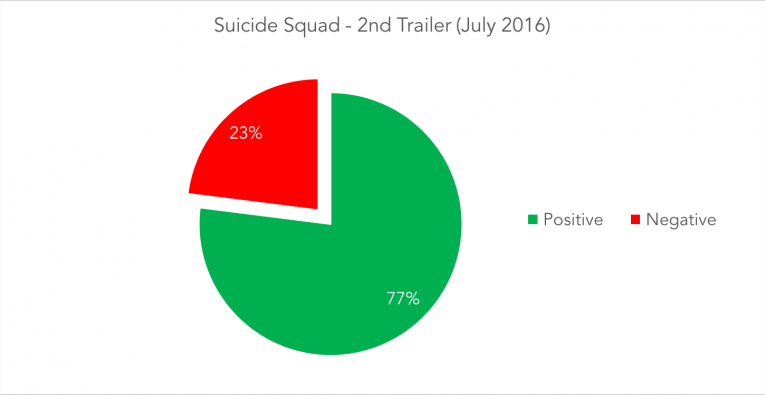 Suicide Squad finished with a global box office of $745 million which placed it just behind Deadpool in the last year’s top 10 grossing movies but only gave WB’s latest expansion of the DC Extended Universe a ROI of 326% based on its production budget of $175 million and is likely much lower when the film’s considerable marketing costs and the film’s re-shoots are added. 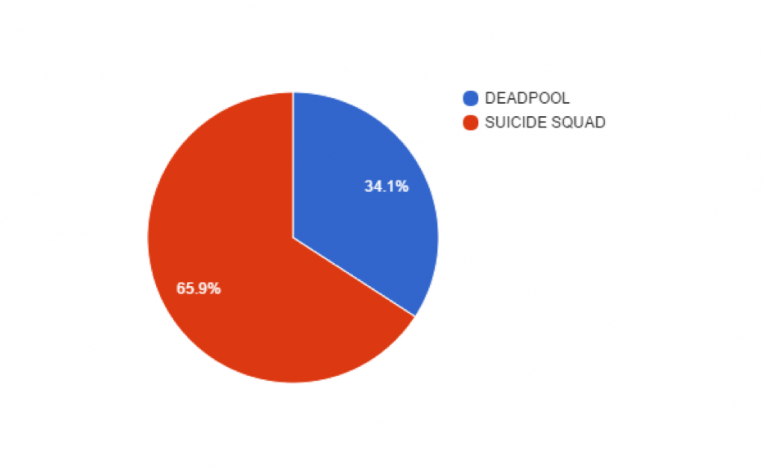 Despite all the advantages Suicide Squad had over Deadpool in terms of more engagement and even more financial investment, the performance of the two titles was nearly inseparable at the box office but there can be little doubt that 20th Century Fox would be far happier with the results garnered by their little anti-hero comic book movie. This demonstrates incontrovertibly that audience sentiment can be just as viable a route to success as increased exposure and marketing might in contemporary cinema's most prosperous genre.